A monument below my hotel window remembering Germany's dead from various wars still has an unused panel. My hunch is that it'll never be used. Maybe I'll spend my old age just gazing out windows from evocative perches in my favorite European villages. While researching the Rhine River Valley recently for the new edition of our Germany guidebook, I enjoyed a corner room with a mesmerizing Rhine view. I'd wake up and find myself captivated by the river scene -- and then realize I was less dressed than was appropriate for that conservative little burg. Putting on a shirt and continuing to enjoy the scene, it occurred to me that I was enthralled by more than the pretty view. It was the rhythm of the mighty Rhine -- so bustling with shipping and history -- combined with the environment: black slate cut from plains above; terraced vineyards zigzagging up hills -- forlorn in the modern economy but still absorbing sun and stocking grapes with sugar; husks of ruined castles, standing as monuments to class warfare, greed, and war; and stoic spires of stone churches slicing vertically through townscapes. The quiet, deep-grey power of the river flows as steadily as time itself, a dance floor where ferries, barges, and sightseeing boats do their lumbering do-si-do past fabled and treacherous rocks. It was here that the ancient Romans decided to call it an empire and draw the line that defined their vast holdings -- a line that separated barbarians from the civilized world, just as it separates Protestants and Catholics today. 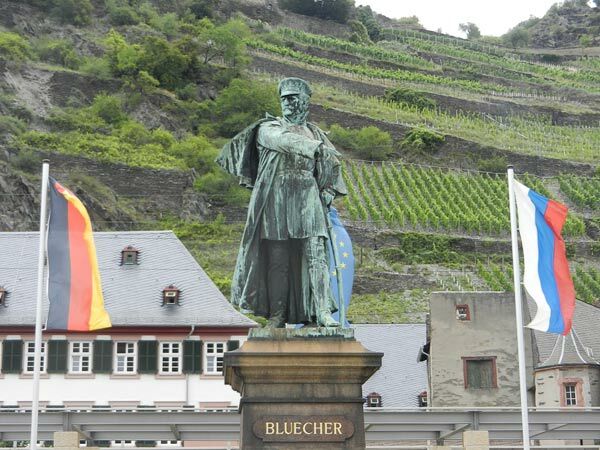 It was here, on New Year's Eve in 1813, that Prussian General Field Marshall Gebhard Leberecht von Blücher, a local hero, used an innovative pontoon bridge to cross the Rhine and flank Napoleon's forces (on their way back from a disastrous Russian campaign). And it was also along this stretch of river that US General George S. Patton's troops found a bridge still standing (at Remagen) to push past the natural barrier the Rhine has always provided Germany against invaders, and ultimately take the war to Hitler's capital, Berlin. A monument below my hotel window remembering Germany's dead from various wars still has an unused panel. My hunch is that it'll never be used. Germany, mighty today without the help of its military, has a profound distaste for wars. Like so many nations, it rose by the sword then fell. Pondering sweeping armies and the rise and fall of great powers (along with my own country's place in the march of history), I think of all the nations in Western Civilization that at one time rose to be dominant powers, then settled back down -- either because of military defeat, economic malaise, or both -- and realize life goes on just fine without all that responsibility. Think about it: Rome, Spain (under Charles V), Austria (under the Habsburgs), France (under Napoleon), Germany (under Hitler), Victorian Britain (upon which "the sun never set"), as well as Portugal, Sweden, Poland, the Netherlands, and, I'm sure, many others. Then, with the political and economic frustration at a rolling boil back home in the US -- which just a decade or so ago was celebrating its status as "the world's only superpower" -- an interesting thought hit me. Had we known that "the Arab Spring" was just around the corner and managed to be patient (as we were to let the USSR rise and fall without a hot war), Saddam Hussein would have been swept away by his own people. The Iraqis surely would have done to their dictator what the Egyptians did to Mubarak and the Libyans did to Gaddafi. The USA would be a couple trillion dollars better off, and Iraq -- rather than becoming a client state of the US -- may have created a homegrown democracy on its own terms.